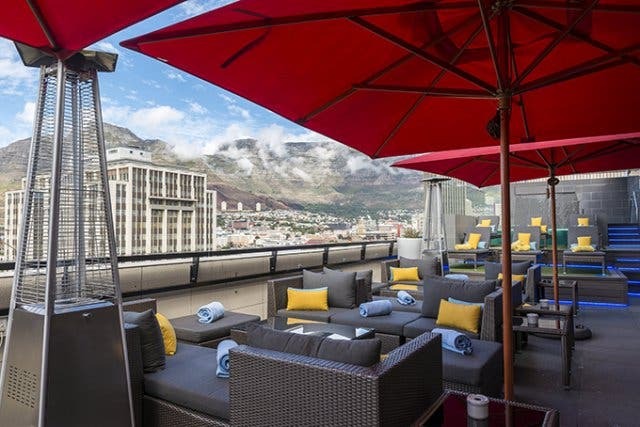 Rooftop bars are the trendiest spots to toast to a productive day, eventful week or successful month, and Cape Town's CBD treats us to some spectacular locations that boast brilliant views. One such place is the Harald's Bar and Terrace housed at the Park Inn Hotel by Radisson. Floating 11 stories up in the sky, this lofty perch lays claim to, arguably, the most impressive panorama in town. 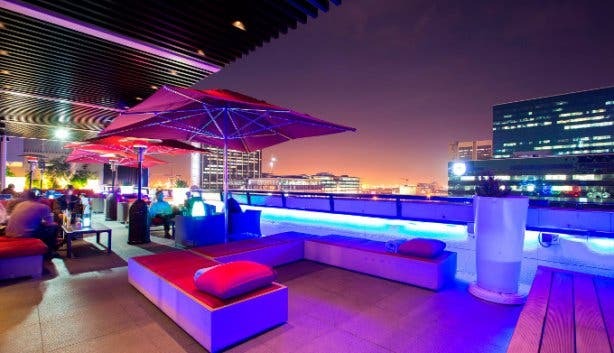 Treating you to a unique gaze of the city centre below you, the rooftop bar also boasts an easy-breezy vacation-style vibe that makes it the ultimate setting for a laidback lunch or sundowners with friends. The bar lives up to the chic reputation Park Inn by Radisson brand has established. 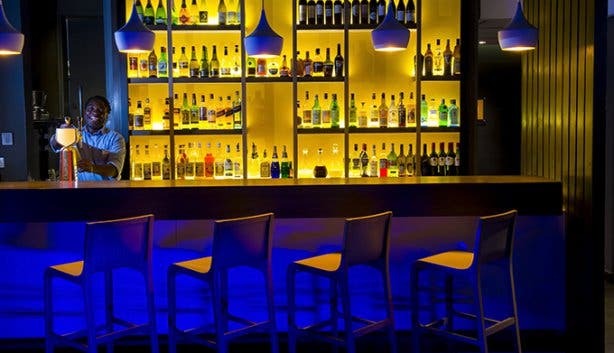 It is completely accessible to the public, not just staying guest which is great news for us locals because it means that Harald’s laidback bar grub and classic cocktails are available to be enjoyed by all. One of the rooftop bars selling points, other than the breathtaking view of course, is the food. The menu, prepared by Executive Chef Nigel Stemmet, comprises mostly of finger foods that are ideal for snacking on or sharing in a tapas style. The list of items includes everything from burgers, chilli poppers, nachos and pizza to ribs, wraps, seafood platters and paninis. Some favourites are the biltong and avocado burger or, a Cape Town favourite; chilli poppers. “There’s pretty much everything for everyone here,” explains Genevieve Evason, the marketing manager of the hotel. If you aren't peckish you can definitely sip on a refreshing cocktail while waiting for the traffic levels to dwindle after work. 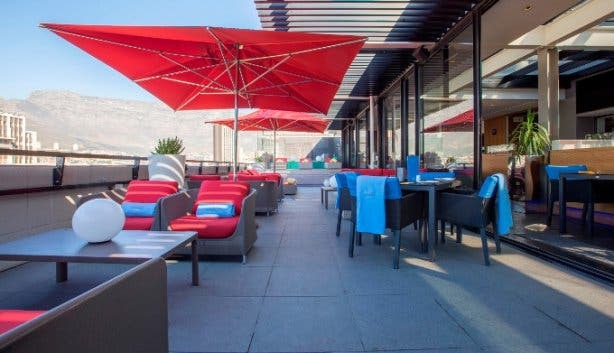 The bar offers a range of brandy-based concoctions (like the Klipdrift Gold Julep), innovative mixology blends, several wines, spirits and craft beers. You'll find your after-work drinks turn into dinner and even a final night cap on the comfortable couches of this cosmopolitan bar and terrace. If you're looking to do something daring; Harald’s has the rather unusual offering of abseiling from its steep ledge all the way down the side of the hotel (it is, apparently, the only building in the CBD that organises formal urban abseiling excursions). “We were looking for something really different and out there,” explains Genevieve. Face your fears; take the plunge from the Park Inn rooftop and soar above the city. 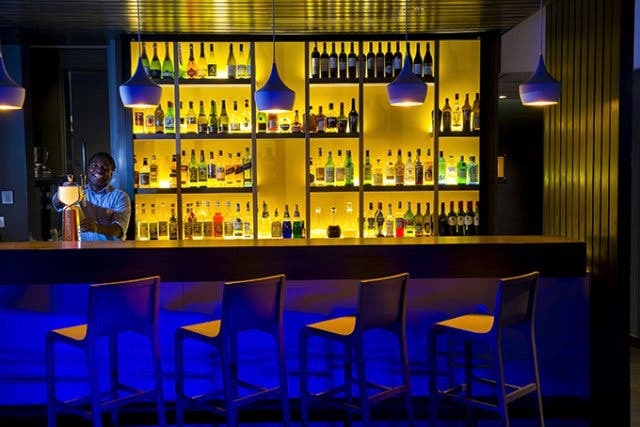 Ultimately, Park Inn has created a swanky, but laid back hideaway that will offer you a view of this glorious city. You'll fall in love with Cape Town all over again. Tip: If you’re after a more substantial post-sundowner meal, head down to the RBG Bar and Grill on the ground floor. Found to the entrance of the building, this restaurant has a fantastic menu that includes pasta(there’s an Asian vegetable stir-fry option), mixed grill, soup, curry and pork belly, offering a contemporary gourmet experience. The Bill: Starters range from R50 to R95, pizzas sit between R80 and R130, burgers are priced from R80 to R130, sandwiches go from R75 to R110 and desserts all come in at R55. Alcoholic cocktails, on the other hand, cost anywhere from R50 to R60. 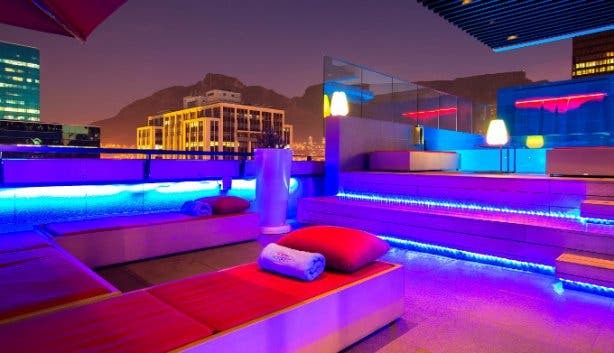 Discover top rooftop bars in Cape Town! For more updates on goings on in the Mother City, subscribe to our newsletter and if you have a smartphone, add m.capetownmagazine.com to your home screen for quick access on the go! Also, follow us on Twitter, like us on Facebook, join our Google+ circle, connect with us on LinkedIn, check out our photos on Instagram and follow our Pinterest boards for updates on what’s happening in and around the Mother City!